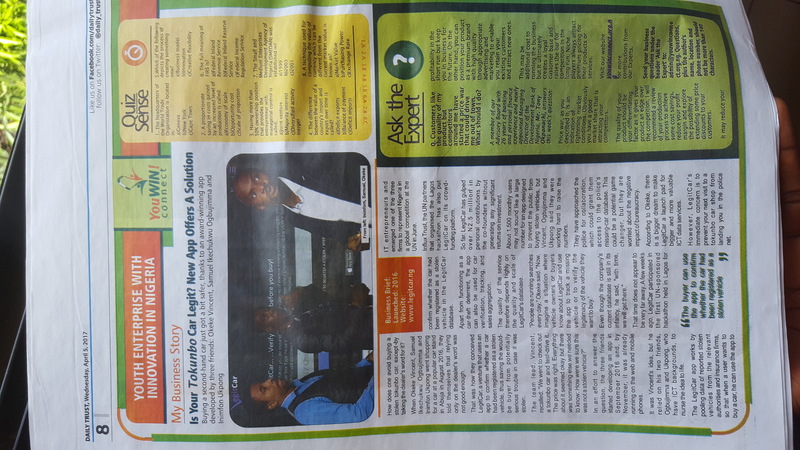 LegitCar is a car theft deterrent system. Since most cars stolen from people either at gun-point, or cars just moved from parking lots, are resold to other people who do not know these cars are stolen, we are working hard to prevent this resale from happening. We sincerely believe that if we make it quite difficult for people who steal other people's cars to resell them, we will be putting them out of business with time. WHAT ARE WE BUILDING AND WHY IS IT IMPORTANT? Everyday in the world people's cars go missing, here in Nigeria and elsewhere in the world. These cars are forcefully taken away from people at gunpoint (some people lose their lives in the process) or they just disappear from the parking lots; and most of it are still resold to other people who don't know these cars are stolen. Our solution, LegitCar, was developed to prevent this resale from happening. We sincerely believe that if we make it impossible for stolen cars to be resold, with time we will be making that line of business unattractive for thieves, and as such make our world a little bit safer. We are building a database of all missing cars in Nigeria and are enabling car buyers search the database to ensure that the cars that they are about to purchase are not listed as one. But if a match is made, they get to see the information of the original owner and get a cash reward if they help reunite the owner with the car. Thus, we aim to impact our world. We are currently compiling the database of missing vehicles in Nigeria at the moment, but will expand to other West African countries as soon as we become fully operational in Nigeria. We are getting this data primarily from the Police, insurance companies, and from the victims themselves by having them register the details on our website. Once we build good database, we will charge a small amount not higher than $1 or $2 per search. We already have some level of interest from insurance companies who are willing to work with us to reverse the losses incurred from claims paid on insured missing vehicles. Though we are still at the demo stage, we already have people go to the site to register the details of their missing vehicles, and others make searches. By donating to this cause, you are doing the much you can to make our world a safer and better place. The whole world owes you a debt of gratitude. HOW ARE WE GOING TO BE SPENDING YOUR MONEY? 1. Logistics and traveling to the Police Headquarters in each of the 36 states of Nigeria to collate the list of missing vehicles and owners' details. 2. Since people will not use the website if they do not know about it, publicity is key to the success of what we are doing. This is where the bulk of the money will be going into: Social media ads, TV ads, Radio jingles, Fliers and banners, etc. 3. We are currently operating out of an office space given to us by someone who believes in the work we are doing to use on a temporary basis. So, we would be spending some part of the money on an office space that will confer the required legitimacy on what we are doing. 4. If we have additional funds left after these, we would purchase a used vehicle in good condition to make our movements in the city and out of it easier and faster. We will be as accountable as possible by giving an update quarterly on how we have spent money, and what we have achieved at the given time. You will also have the chance to make suggestions and recommendations, thereby having a say on how money is being utilised. 1. 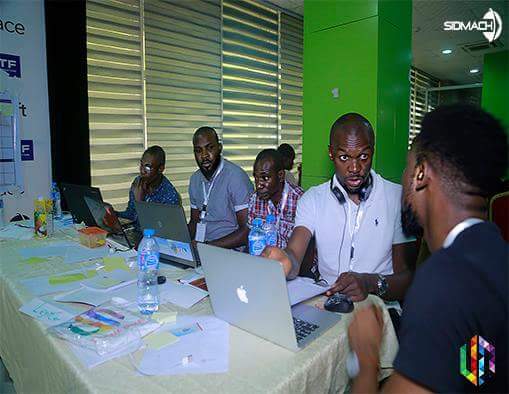 Team LegitCar working together at the UN INFLUX HACKATHON before the pitch in Lagos, Nigeria. 2. 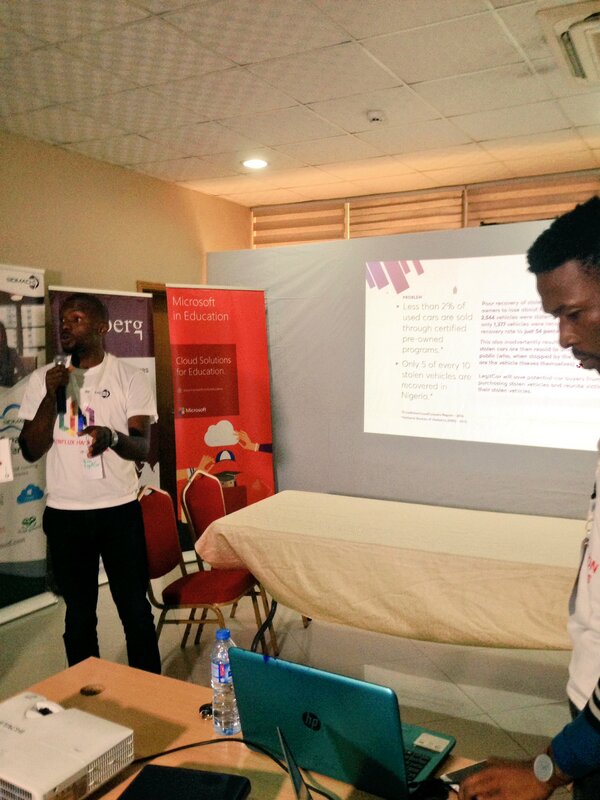 Team LegitCar during the pitch. 3. 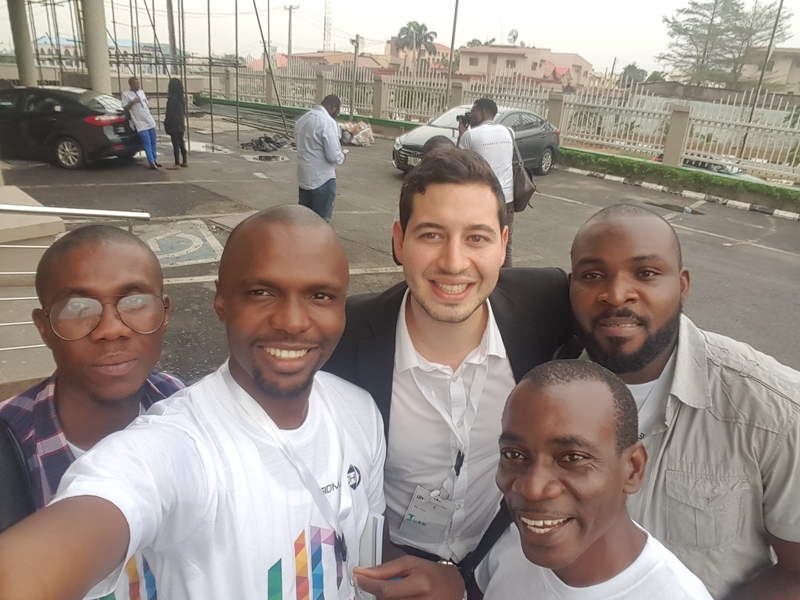 Some members of the LegitCar Team with an attendee impressed with our performance. Yet to be determined, but will be worth it.